A ribbon-cutting, tours and a very special toast ushered in a new era for Pasadena Water and Power Oct. 20 when the groundwater treatment plant at Monk Hill was celebrated with a grand opening. The project is cleaning perchlorate and other compounds from four City of Pasadena water wells near JPL that were contaminated by volatile compounds from rocket fuel that was was dumped into pits after World War II and leached into the ground over the years. Left to right in the photo above are California Assemblyman Anthony Portantino, PWP Principal Water Engineer Gary Takara, PWP Water Engineering Manager Brad Boman, Mayor Bill Bogaard, NASA Facilities and Environmental Manager Steve Slaten, EPA Superfund Director Jane Diamond, NASA Strategic Infrastructure Manager Olga Dominguez and PWP General Manager Phyllis Currie. 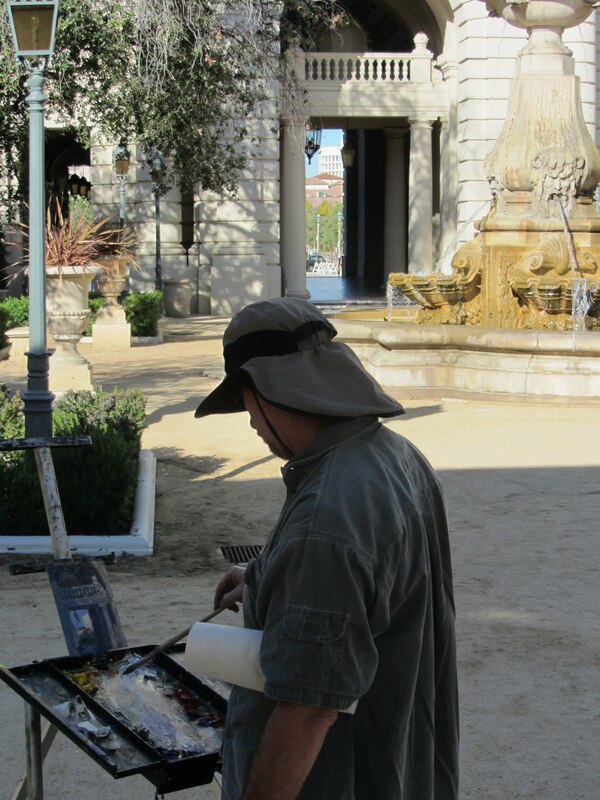 It was the culmination of more than 10 years of partnership among the City of Pasadena, NASA, EPA and other agencies to bring the project to fruition. The event included tours of the treatment plant as well as the adjacent Windsor Reservoir (that's Brad Boman in the photo below leading a tour inside the reservoir). Many thanks to Eric Reed for the photos. Be Prepared at 10:20 a.m. today! Are you be ready for the Great Southern California Shakeout today at 10:20 a.m.? We want you to be part of it, and that means learning how to protect yourself properly during the next "Big One." Dr. Lucy Jones of the U.S. Geological Survey has led an alliance of scientists, emergency managers, engineers, government officials and others to study the likely consequences of a potential magnitude 7.8 earthquake in great detail. The result is the ShakeOut Earthquake Scenario. The Great Southern California ShakeOut is one opportunity to practice your earthquake survival skills. These kinds of drills train us to act quickly – to Drop, Cover and Hold On immediately to minimize injury. 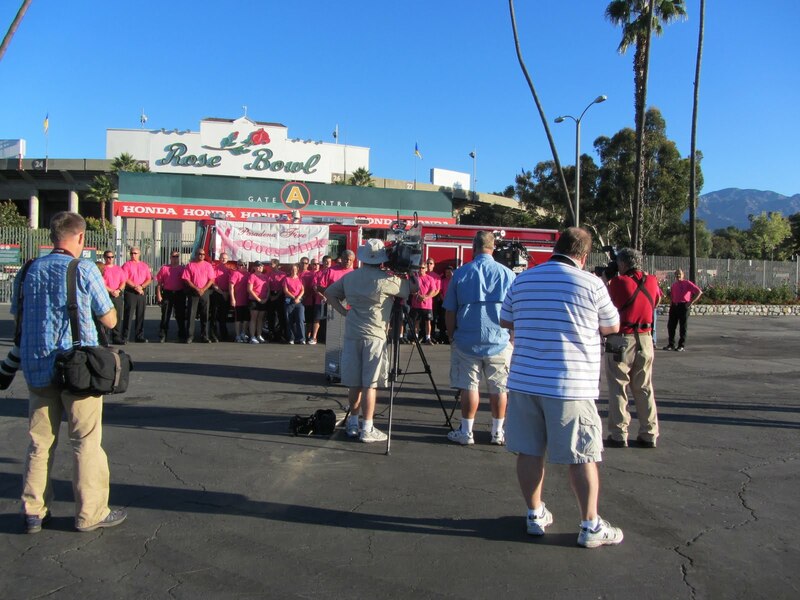 The Pasadena Fire Department continually spreads the word to Pasadena residents, neighborhoods, schools, the faith community, businesses and non-profit organizations throughout the community, and emergency crews review preparedness plans to make sure they’re as complete as possible. 1. Drop to the ground, take Cover under a sturdy table or desk, and Hold On to it as if a magnitude 7.8 earthquake were happening. Stay down for at least 60 seconds. Practice now so you can protect yourself immediately during a real earthquake. (Why should you Drop? Because in a major earthquake, if you don't drop to the floor on your own, the force of the energy will knock you off your feet. Why should you Cover? Because objects in your home or office will probably be flying all over the place. 2. While still under the table or desk, look around and imagine what would happen in a major earthquake when shaking may last for one to two minutes. What would fall on you or others? What would be damaged? What would life be like in the immediate moments after? What should you do before the actual earthquake happens to reduce losses and recover quickly? You can't know unless you plan ahead! 3. Practice what you will do after the shaking stops. 4. Complete your disaster plan and emergency preparedness kit as soon as possible. For vital information and to sign up for Pasadena Emergency Response Team (PERT) training, visit www.cityofpasadena.net/disaster. Some Internet sites and several email chains have recommended a "Triangle of Life" position to be taken during major earthquakes, under the assumption that most Americans will have their homes and workplaces collapse around them. Don’t believe it! The fact is that there is absolutely no scientific research to suggest that the Triangle of Life position works, and agencies such as the American Red Cross, U.S. Geological Survey and Governor's Office of Emergency Services have gone on record as disputing this viral rumor. It has been proven time and time again, during documented scientific research, that the Drop, Cover and Hold On technique is the best method for survival in the U.S. Here's a little video a Leadership Pasadena class produced. Thank you, readers of the Pasadena Weekly, for filling out the annual "Best Of" poll and saying I'm the best public employee. One day last week I saw a man with paints and easel in the courtyard at Pasadena City Hall. 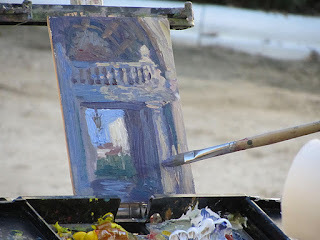 He was painting his interpretation of the east side of the grand entrance looking through to Holly Street. There's not a bad view of City Hall anywhere, which is why artists, photographers and film production companies flock to this place. D5 rep wins with her 9:21 a.m. Tuesday guess "opening of the court house?" In the Jan. 12, 1954, photo above, the Pasadena Municipal Court building in the civic center is rededicated in conjunction with its new ownership by the county of Los Angeles. Everyone is reciting the Pledge of Allegiance, led by L.A. County Sheriff Eugene W. Biscailuz. A few years later, the county added the huge monstrosity that encompasses the L.A. County Superior Court to the north end of the historic building. 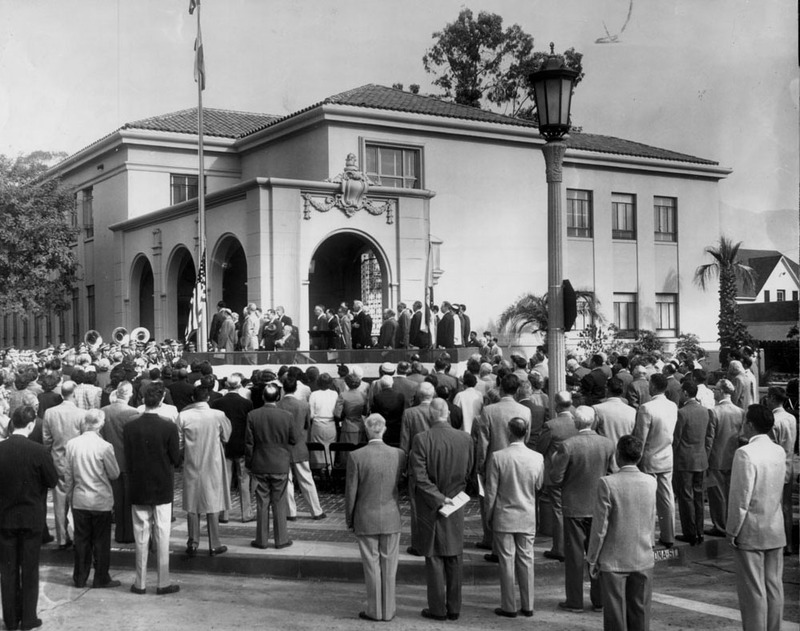 That "modern" courthouse has been an eyesore in the stately Pasadena Civic Center ever since. The exterior used to be red brick and gray concrete. It underwent a facelift couple of years ago, so at least it's a more neutral color. I'll get more detailed with Mystery History reveals after Oct. 31, when I'll be back on a full-time basis. 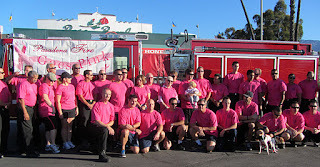 Pasadena Firefighters Are in the Pink! Pasadena firefighters participated in a photo opportunity in front of the Rose Bowl Stadium this morning, followed by a walk around the 3.3-mile Rose Bowl Loop. 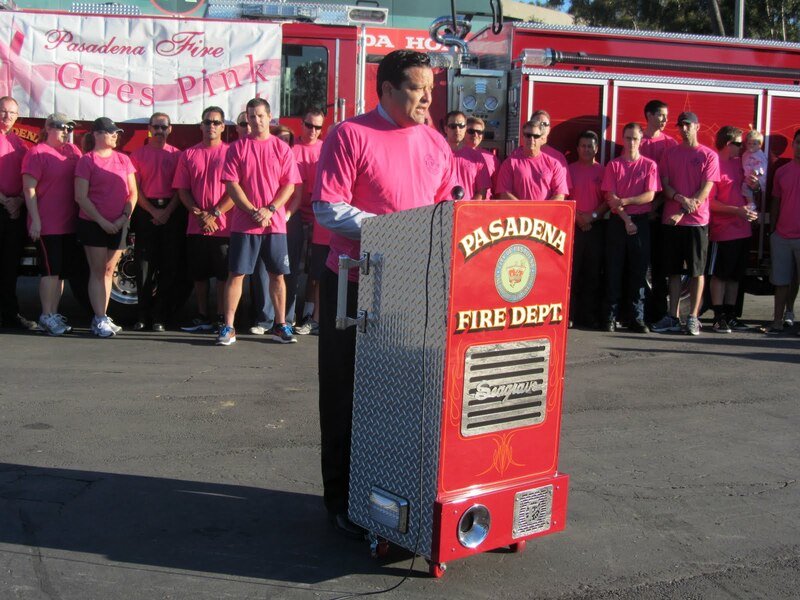 They traded their Pasadena Fire Department uniform shirts for pink t-shirts to help raise awareness of breast cancer, women's cancer research and the benefits of exercise for cancer prevention. 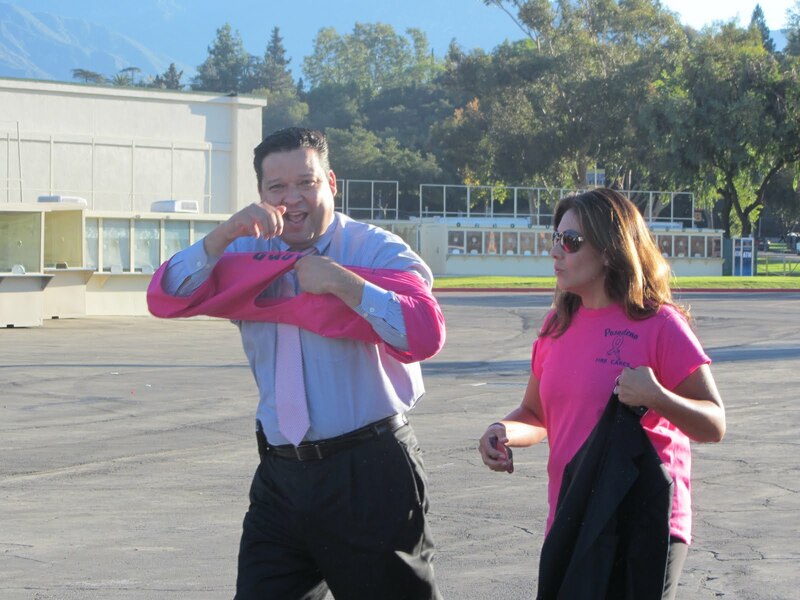 Pasadena City Councilman Victor Gordo and his field representative Vannia De La Cuba donned the pink shirts as well! And Vannia did an on-camera interview with Azteca TV (channel 26). Purchase your very own t-shirt for just $20 at Fire Station 33, 515 N. Lake Ave., or at pasadenagoespink.com. All proceeds will be donated to the Susan G. Komen Foundation. 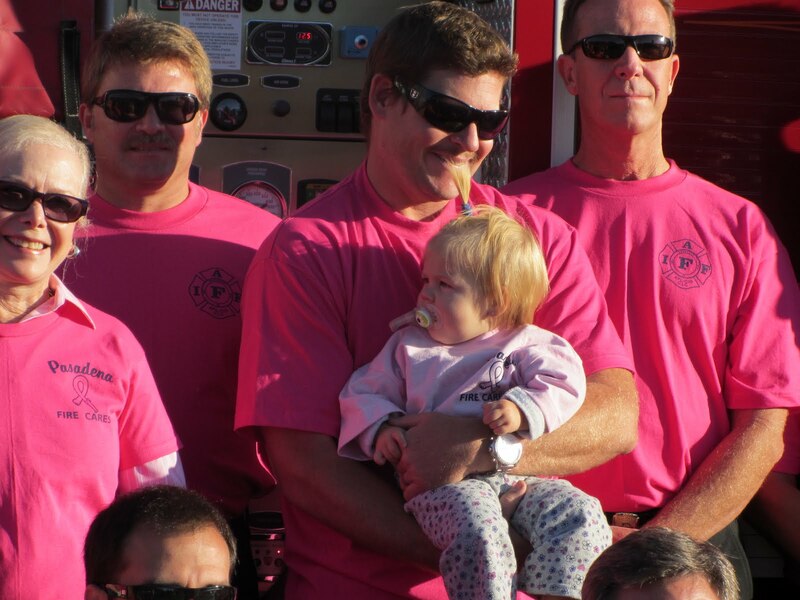 They even come in children's sizes, although apparently not small enough for Pasadena's youngest future firefighter! I'll post the full scoop on Thursday.